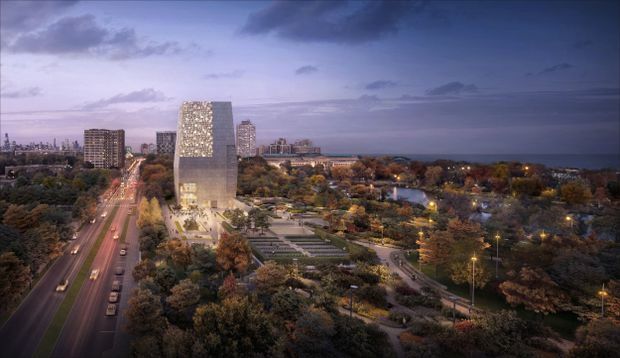 A model shows the tower-like museum at the heart of Barack Obama's planned presidential library site, a 19-acre project in Jackson Park in Chicago's South Side. Barack Obama wants to build his presidential library in a park on the South Side of Chicago, the city where he met his wife and launched his career. Who could possibly object to that? Quite a few people, it turns out. This cannot be what Mr. Obama expected when he first offered what seemed like a gift to his adopted hometown. The proposal to put his library in Chicago looked like a slam dunk. Though he was raised in Hawaii and Indonesia, Mr. Obama worked in Chicago as a lawyer, a law professor and a community organizer on the struggling South Side. His much-admired wife, Michelle, grew up in a cramped Chicago bungalow and calls herself a proud South Sider. After moving into the White House, the Obamas held on to their stately house near the University of Chicago. 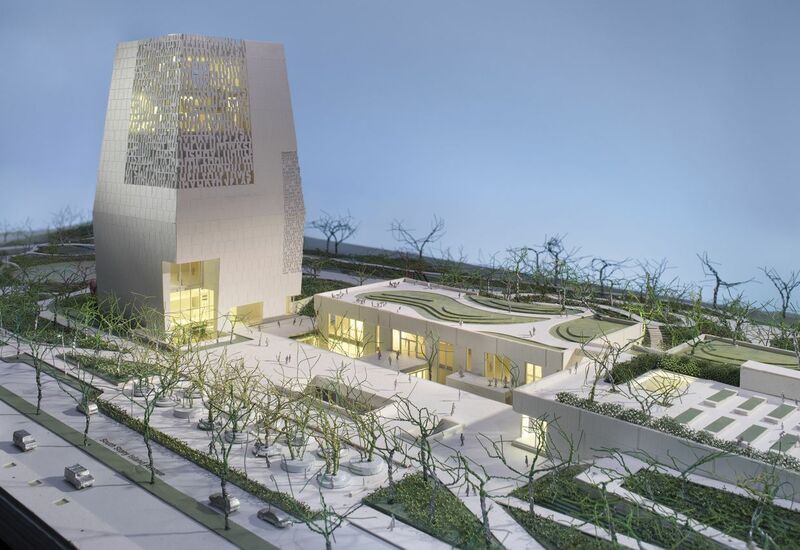 They promise that the Obama library complex will help lift up poor, overwhelmingly black neighbourhoods nearby. But things are never simple in American politics, especially at this time of sharp political division. And so the favoured project of Chicago’s favourite son has run into a hail of opposition, much of it from community workers like he once was. They say the library will drive up rents and force out poorer residents. They want a guarantee that jobs and other benefits will flow to South Siders, not outsiders. A whole separate line of opposition comes from conservationists who oppose putting the complex in a classic lakeside park. The debate has stirred up strong feelings about race, poverty, segregation and urban inequality. Creating a presidential library after leaving office is a prerogative of modern American presidents. The country has 14 of them, from the Dwight D. Eisenhower library in Abilene, Kan., to the Ronald Reagan library in Simi Valley, Calif. They typically house presidential papers and displays on the president’s life and times. The Obama Presidential Centre promises to be the most ambitious yet. The cost has been put in the half-a-billion range. Along with a library, the complex will include a tower-like museum with an observation deck; a forum building with an auditorium, winter garden and other meeting space; an athletic centre for the use of the community; a public plaza for markets, fairs and other events; and extensive landscaped grounds that include a sledding hill for kids. In an artist's rendering, the presidential centre's museum tower looms behind a public promenade. The site is in Jackson Park, on Chicago's South Side, a historic parkland designed by the same architects behind New York's Central Park. The focus of the centre, though, will be on fostering the leaders of tomorrow. “What we want this to be is the world’s premier institution for training young people and leadership to make a difference in their communities, in their countries and in the world,” Mr. Obama said. His Obama Foundation estimates the centre will draw as many as three-quarters of a million visitors a year and generate thousands of jobs. A “diversity consultant” will make sure many of the jobs go to minority workers and contractors. The area could clearly use a boost. Abandoned and burned-out houses dot its residential streets, a graphic contrast to the handsome homes around the adjacent University of Chicago, with its well-tended grounds and vine-covered buildings. But critics of the Obama centre doubt that locals will truly gain from the kind of change it will bring. They are lobbying for a community benefits agreement, or CBA, that would nail down the jobs and other help that would flow to locals. Unless they get it, they say the surrounding area will turn into a gentrified playground for tourists and better-off Chicagoans. Gentrification – the upscaling of older neighbourhoods as new residents move in – has become a big issue in black communities from Brooklyn to San Francisco. Activists argue that just the prospect of the library is already pushing up property values. In Woodlawn, a needy neighbourhood just inland from the site, home prices went up 23 per cent in a six-month period last year, though the median selling price was still pitifully low: US$133,800. The library-driven real estate boom even earned a mention on The Chi, a hot new TV series by Chicago native Lena Waithe about life on the South Side. Rising house prices mean some rents and property taxes are going up, too. “For households that are some of the most vulnerable in our country, that increase can be the straw that breaks the proverbial camel’s back,” said Jawanza Malone, head of a group that helps low-income residents. The opponents are making such a noise that Mr. Obama himself felt the need to jump into the debate recently. In a visit to the city at the end of February, he said it was not his impression “that the big problem on the South Side has been too much development, too much economic activity, too many people being displaced because all these folks from Lincoln Park are filling in to the South Side.” Lincoln Park is a well-off, mainly white North Side neighbourhood. 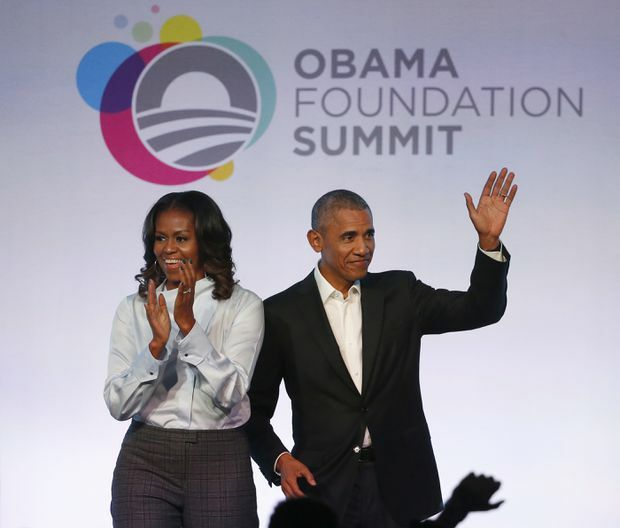 Mr. Obama, whose foundation estimates the centre will draw as many as three-quarters of a million visitors a year, has waded into the public controversy about its impact on the neighbourhood. But for the project’s second group of critics, the site is far more than a patch of grass. Mr. Obama plans to plunk his library in historic Jackson Park. It was designed by Frederick Law Olmsted and Calvert Vaux, the famed landscape architects of New York’s Central Park. Jackson Park was the site of the World’s Columbian Exposition, the Chicago fair of 1893. It connects to nearby Washington Park by way of the delightfully named Midway Plaisance, a stretch of linear park that is another Olmsted and Vaux creation. “It would be fine with us if Obama had the greatest library known to man – just not in a public park,” said Juanita Irizarry, executive director of Friends of the Parks, an advocacy group. She says feelings about the issue have become so inflamed that some library backers are even suggesting that “if you say you don’t want this in a park, you must hate all black people.” In fact, says Ms. Irizarry, who is of Puerto Rican background, those who are campaigning against the Jackson Park site simply want to protect Chicago’s unrivalled park system, which includes a famous green band that stretches along Lake Michigan from north to south. More than 100 University of Chicago faculty members signed a letter in January opposing the use of Jackson Park. 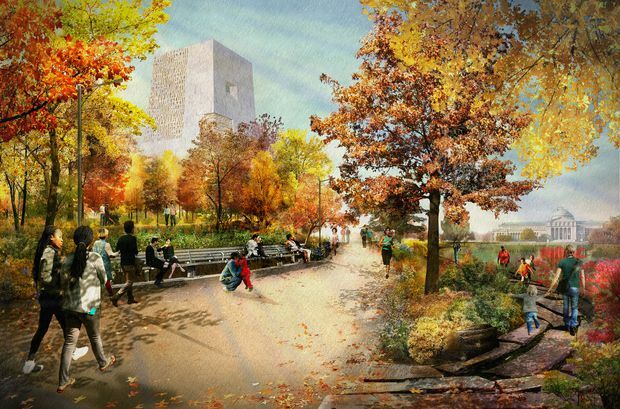 They say Olmsted’s democratic vision of a park for everyone rules out monuments to great men. Another group of professors calls that absurd: There is nothing more democratic than welcoming thousands of visitors to a centre named for the first black president, whose election was a landmark for American democracy. Walking her dog around Jackson Park on a recent afternoon, she noted that the Obama complex will take up only a 19-acre portion of a 500-acre park – and an underused portion at that. Often, she said, she is the only one around. Most likely, the project will go ahead despite all the controversy. Rahm Emanuel, the mayor of Chicago and once Mr. Obama’s chief of staff in the White House, is a strong backer. So is the rich and powerful University of Chicago. Mr. Obama himself is raising millions of dollars from wealthy supporters to make sure it is built. To calm the critics, the Obama people have tweaked the project. They scrapped a surface parking lot on the Midway Plaisance and replaced it with an underground garage. 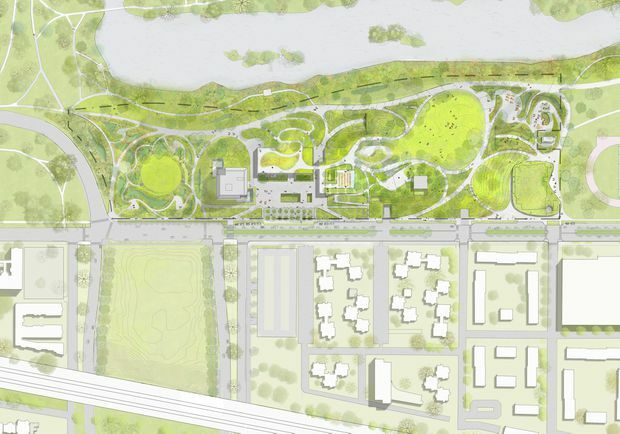 They added a bike and pedestrian “promenade” and made other landscaping changes to make the centre fit the Olmsted and Vaux feeling of the park. If city officials give their stamp of approval, organizers hope to get shovels in the ground by the end of the year and have the centre open in 2021.